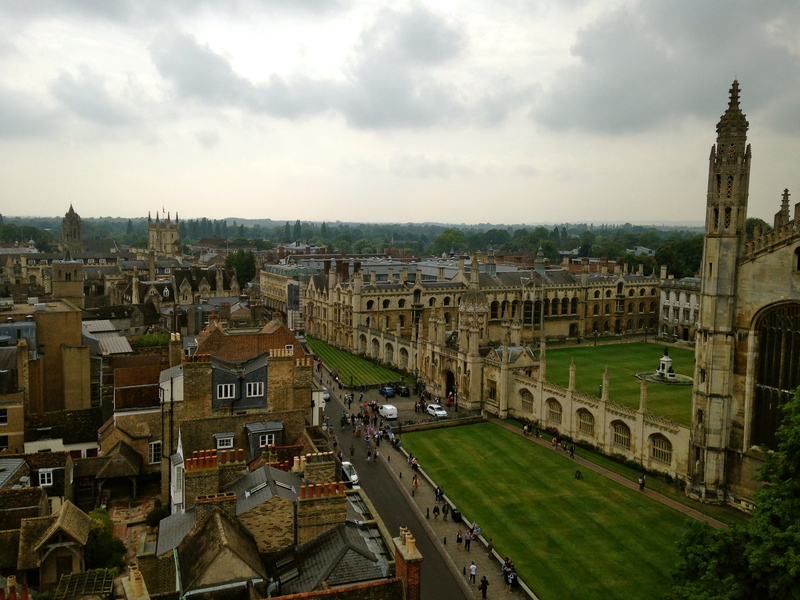 COLA Study Abroad Interview- Sarah Milicia-Cambridge | Welcome to COLA Study Abroad! 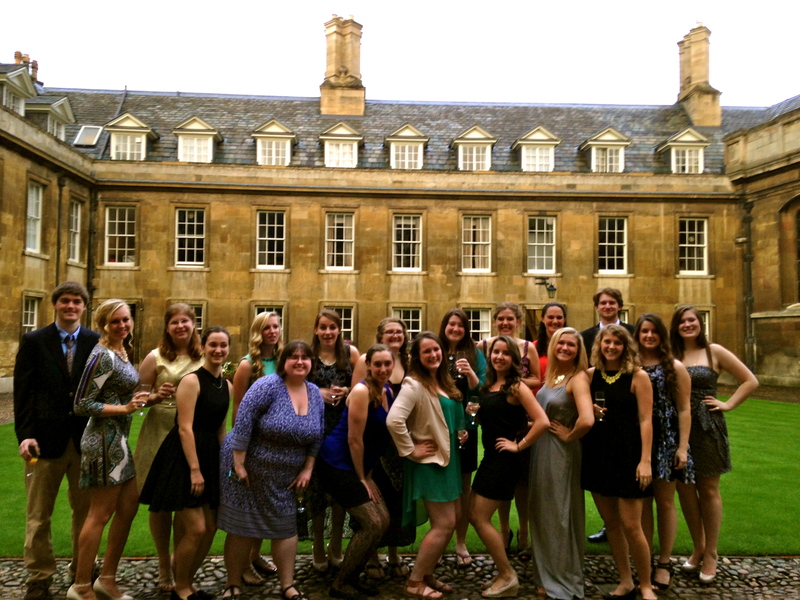 Photo: Sarah and the rest of the Cambridge program at their last dinner. Sarah Milicia: I am a senior English major, Italian and Women’s Studies minor. I’m from Fairfield, Connecticut and I am a lover of all things mint. You can find me enjoying a good book with a cup of coffee here at UNH almost always. Ideally, I am looking to go into the editing and publishing field. COLA: Why did you choose Cambridge? Sarah: I chose the Cambridge Summer Program because I have always been a fan of British literature and history, and seeing as the program offers English and History courses, it was a perfect fit. I remember reading up on Cambridge, and Cambridge University, and literally getting chills because the cultural and historical significance of the location is incredible. 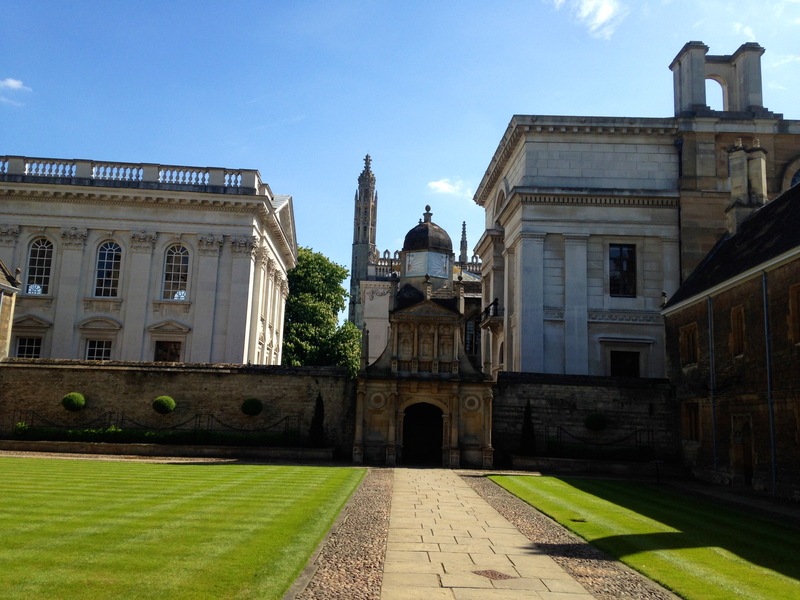 To spend six weeks in Cambridge would be an unforgettable experience I thought, and it did not disappoint. COLA: Have you noticed any differences in Britain versus in America? Sarah: A major difference was that we were not allowed to walk on the lawns within the courts of each college. Gonville and Caius College is where the UNH program had its meals, courses, teatime, and meetings, so we were always walking in and out of this particular college. Within Gonville and Caius there were three courts, and signs very clearly stating we were not allowed to walk on the grass. We were only allowed twice, for our Opening and Closing Banquets. It actually made us feel very formal and important when we had those events. It was fun, and very different from UNH, where I am constantly sprawled on THall lawn doing work when the weather is nice. Another difference was the regality of the dining hall. Picture the Great Hall in Harry Potter movies… that is literally what this dining hall looked like. COLA: What courses did you study while in Cambridge? Give a few examples of ways in which you were able to tie the knowledge you gained in your classes into the way you understood your host city. Sarah: For the Cambridge program, I took two courses. There were six to choose from, and I knew I wanted to take one English and one History course. I am a fan of British plays, so when I saw a course called “Entertaining Crime in English Renaissance Literature” I was all in. Some of the plays included Johnson’s Bartholomew Fair and Shakespeare’s Measure for Measure. I learned about the development of the playhouses, playwrights, and literature in general during the 16th century of England. For the history course, I knew I wanted to take “Britain and the World Wars.” The year I was in Cambridge was the 100th anniversary of the start of World War One. As a result, Cambridge itself had many events and memorials in honor and in remembrance of those lost during the war years. World War I and Two still weighs heavily on England, and this course was very relevant and important to the country I’d be studying in, and to my own interests. COLA: Did you find your course work pushed you to explore more of Cambridge that you might not have otherwise? Sarah: Yes, I learned a lot about the population explosion that occurred in England, in London specifically, during the 16th century, which created anxieties towards crime during this time period. The playhouses were not viewed in a positive light from the church or upper classes, and playwrights took inspiration from the fears of crime and inserted this theme into their plays. It was very interesting to see how the country developed in the 16th century and how literature addressed the issue of crime. 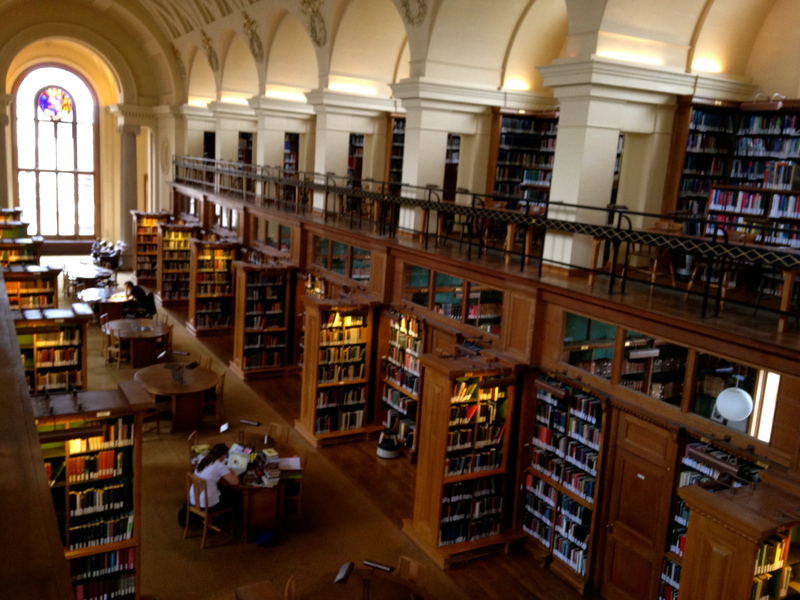 The library in Cambridge was open to us, and I would go and read more about this particular time period, and research the impact of literature. For me, this was very fun and I got to understand more about how British literature came to be. In regard to the history course, I learned a lot about World War I and II from the perspective of the British. It was very different reading documents, sources, and propaganda posters with a British audience in mind, as opposed to an American audience. I explored many memorials in Cambridge, and many churches in and surrounding Cambridge, which honor those who fought during both wars. Even today, those two wars have heavy significance. The Tower of London also had a Poppy Installation, which I made a point to see when I studied in London during the fall semester. I don’t know if I would have felt as strongly if I had not taken the “Britain and the World Wars” course during the summer. COLA: What were your thoughts when you were sitting on the plane to your host city? And what about the plane ride home? Sarah: I was wicked excited. I do not get homesick, and I have a taste for adventure, so when I got on the plane by myself at Newark Airport I was very much looking forward to arriving at Heathrow Airport. On the flight back home, I was really sad to leave. However, I sat next to an older woman who was from Sweden, and we talked most of the flight to the States. We are now email buddies and keep in touch. I have learned that you can make connections with people anywhere you are in the world, and that is a pretty cool thing. COLA: Did you manage to travel outside of England while you were abroad? Share a few of your best tips for other students who are planning their own adventures. Sarah: I definitely recommend going on the Bonus Weekend to Scotland. We stayed in Edinburgh, and got to explore Edinburgh Castle, see the Fringe Festival on the Royal Mile, and attend the famous Royal Edinburgh Military Tattoo, which is an annual series of performances by the British Armed Forces, Commonwealth, and International military bands. Lots of bagpipes, tartan, and I also tried haggis, which wasn’t too bad! COLA: Did you feel safe and welcome while you were in Cambridge? Did you know anyone else on the program before you arrived? Was there a sense of community around your program? Sarah: I immediately felt welcomed upon arriving. I actually met two girls at the bus stop at Heathrow Airport, and we rode to Cambridge together and helped each other stay awake to avoid jet lag later on. I did not know anyone prior to arriving in England, and by the end of the six weeks I felt like I had a second family. Even now, over a year later, we have had Cambridge reunions, and still keep in touch. There was a strong sense of community, and we all looked out for each other. It was one of those experiences where I (still) feel the need to pinch myself that it really happened. COLA: What personal and professional changes have you seen in yourself since you began your study abroad program? Are they positive or negative? Why do you think these changes have occurred? Sarah: All very, very positive changes. I realized that I love traveling, meeting new people, and experiencing different cultures. I have looked into many teach English abroad programs, and am considering this after I graduate in May of 2016. This was not something I was considering prior to my abroad experiences. Having had a taste of different places in the world, I do have an urge to continue to explore. I have learned that I am capable of being entirely independent, resourceful, and mindful of cultures. And, I have made fantastic lifelong friendships as a result of the Cambridge program.